Northants definitely did it the hard way in the group stages of last year’s NatWest T20 Blast. 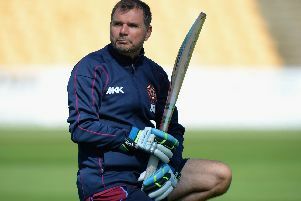 And head coach David Ripley has urged his team to get off to a far better start than they managed in the 2015 campaign, which culminated in an appearance in the showpiece at Edgbaston. The Steelbacks lost their opening three T20 games before showing real steel to bounce back and book their place in the quarter-finals. After the sluggish start, they went on to win seven of their next 10 matches to set up a last-eight encounter at Sussex. And after sinking the Sharks, they went on to beat Birmingham Bears in the semi-finals before falling just short against Lancashire Lightning, who were crowned champions. Ripley was proud of the memorable run his men went on, but he would rather they make life a bit easier for themselves this time round. And he and the players have already spoken about getting off to a flyer at Leicestershire Foxes on tonight. “We were a bit slow out of the blocks and we wouldn’t particularly want to do it the same way this year,” Ripley said. “We don’t want to be losing our first three matches, but in terms of proving we can qualify for quarter-finals, we’re very confident we have the players who can get through to the last eight and once you’re at that stage it’s just about how you play on the day. “The season has stuttered along a bit in terms of weather and the consistency of our performance and with those two things combined, it’s been a bit stop-start so we’re very much looking forward to getting into the T20 matches. And he added: “We’ve talked about that slow start last year and we’re ready. “There’s a bit of luck required with how your fixtures fall and we haven’t had a week off in the last four weeks so we haven’t had much opportunity to focus on T20 cricket solely. “That’s the luck of the draw and some teams have been off this week to get a chance to do a bit, but we haven’t. Ripley has a right to be confident about his team’s chances because he has managed to retain many of last season’s stars. David Willey’s departure to Yorkshire and the loss of Shahid Afridi to Hampshire will undoubtedly have been disappointing, but Northants performed admirably when neither were playing last season. And Ripley said: “Everything looks very similar. “Obviously David Willey is a very fine cricketer and particularly anyone who is playing for England in white ball cricket is going to take a bit of replacing, but he didn’t play all our games last year. “He was missing for a few while he was away with England and with injury and we won games last year without Dave, so it will be up to someone else to try to fill the hole that he leaves. “Everyone else has been with the group and the overseas player has a similar role in our team to Shahid Afridi, with leg-spin and a bit of power hitting. While Northants have added Sri Lanka all-rounder Seekkuge Prasanna, who will be available for all 14 group games, to their squad, Leicestershire have also changed their side slightly. And Ripley said: “Leicester have had an injection of new players. “They’ve got their lights there and it will be a good atmosphere there. “It will be a good place to start. “Their bowlers will be the same this year as they were last year, with (Clint) McKay and (Ben) Raine, and Jigar Naik bowling some spin. “They’ve obviously got a new captain, with (Mark) Pettini captain in their white ball cricket so he’ll be keen to impress at the top of the order. “The two O’Brien lads (Kevin and Niall) are there and they’re a dangerous team.